Successful TV series Glee director Ryan Murphy’s big screen adaptation of the Elizabeth Gilbert bestseller Eat Pray Love staring Julia Roberts as a New York writer who decides to embark on a years journey of spiritual discovery is infused with a luminous glow from the opening scene in luscious Bali. No such thing as a guilty pleasure – just indulge! 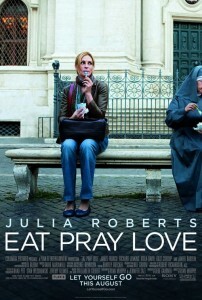 Whilst any self-discovery novel is difficult to bring to the big screen especially as Elizabeth Gilbert writes about her own experience on a years trip to Italy, then India and finally Indonesia, Julia Roberts delivers a fine performance as Liz relishing in the exotic locations and a wonderful supporting cast which seems to improve as the 2 and a half hour film progresses. The Italy section is superb and the locations especially Rome, the Italian actors and naturally the food are sumptuous and particularly easy on the viewer making the Eat section utterly enchanting. Whilst Murphy tried to imitate the opening sequence of Slumdog Millionaire in the India section, the most moving part of the film is a standout character performance by Richard Jenkins as Richard from Texas. For in the novel, Eat Pray Love, Richard from Texas was a character written with such accuracy and obvious charm that I kept wondering which actor would fill that part. Jenkins does a superb interpretation of a middle-aged American who has literally lost everything landing up at the Ashram to clear his mind and an overwhelming sense of guilt. The final section of Eat Pray Love, set in Bali was fascinating but after Italy and India, felt a tad faded although the scenery is still ravishing. As far as adaptation goes, the film sticks very close to the novel and Julia Roberts does a hugely impressive task of managing a character that has travelled not only literally across the globe, but also spiritually from a discontented New Yorker escaping an ugly divorce to a woman who has found serenity and peace as she discovers love again in a most unlikely man. 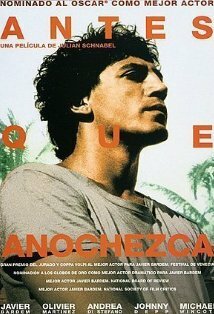 Javier Bardem whilst always gripping to watch, gave the impression he was not quite comfortable in such a largely commercial film as Eat Pray Love. Bardem is more at home in edgier roles playing the Spanish seducer in Vicky Cristina Barcelona or the psychopathic killer in No Country for Old Men or the gay Cuban poet in Julian Schnabel’s Before Night Falls. Bardem’s role as Felipe the love interest for Liz in the Love act of the journey lacked edge and panache in a role that was as unclear in the novel as it appeared in the film. Although watching Roberts and Bardem together was certainly interesting more for the lack of sparkle than the effort the two actors put in to contrive to make their romance believable. Best scenes in the film are most certainly in Rome (all the sequences are exquisite) and the delightful meals Roberts character is served puts Babette’s Feast to shame. Worst scene in the film was the ending, but I’ll leave that up to the viewer to decide. 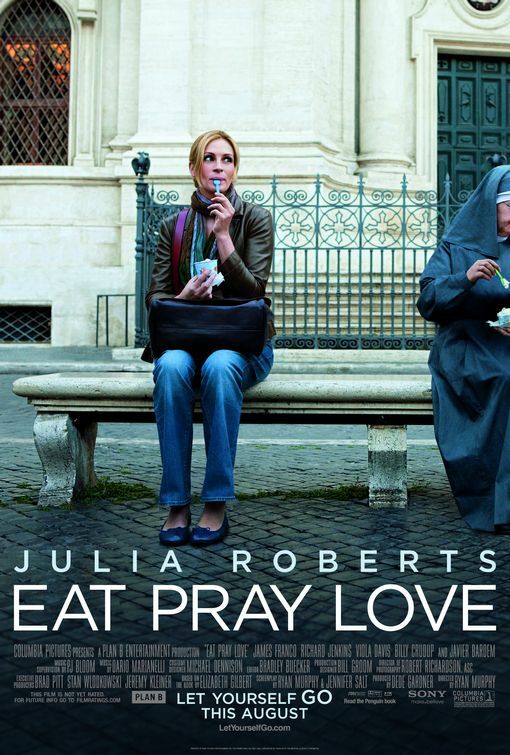 Most consistency in Eat Pray Love was the varied choice of actors who played alongside Julia Roberts as her character travels the world, from Billy Crudup to the shamefully underutilized James Franco to Richard Jenkins and finally to Javier Bardem. As for it being a woman’s movie, not really as regardless of one’s gender anyone who has ever desired to travel or more importantly decided to take a year off from the monotony of urban living and responsibility and see countless exotic locations could surely identify with Liz’s journey. Eat Pray Love should feature at the Awards season if not for Julia Roberts most certainly for a supporting actor nomination for Richard Jenkins. Whilst it is no Razor’s Edge, Eat Pray Love will find many ardent fans the world over.